Now in 2015, Rihanna is one of the most expected attractions of the festival. The tickets for her show were totally sold within 57 minutes only, a sales record in Rock In Rio. The fans are eager, as the show will include songs of her next album “R8”. Rihanna headlined the Rock In Rio Festival with an amazing performance. Rihanna is having one hell of a year. The Bajan beauty made history as the first black woman to front a Dior campaign, she is PUMA’s new creative director recently releasing a new pair of sneakers, she has a new fragrance and now she’s headlining one of the biggest festivals of the year. 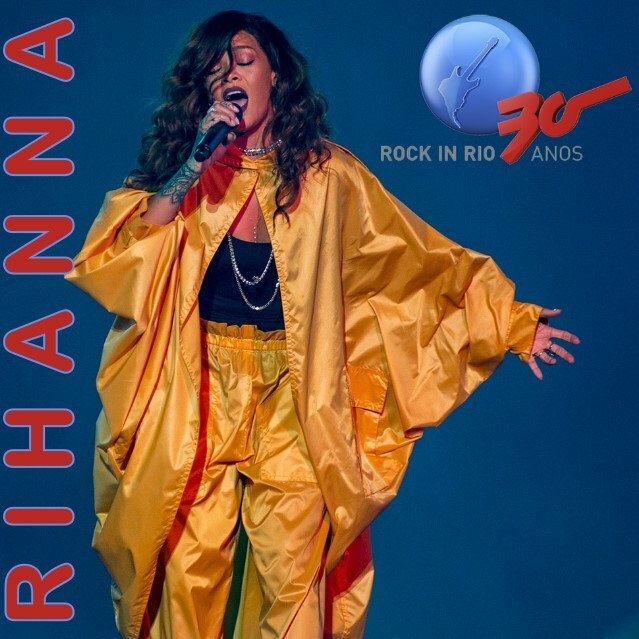 Coming back for the third headlining performance, RiRi rocked the stage at the 2015 Rock In Rio Festival in Rio de Janeiro, Brazil with 85,000 screaming fans. While we still wait for Rih’s upcoming R8 album, the Pop princess performed a few of her classic hits such as “Umberella,” “What’s My Name,” “Only Girl,” and “Love The Way You Lie.” She dominated the stage with a few of her newer hits as well, including “FourFiveSeconds” and “B*tch Better Have My Money.” She also performed "Birthday Cake" where she rapped ex-boyfriend Chris Brown's verse on the track. And the crowd loved every bit of her set. Rock In Rio 30 Anos 0 out of 5 based on 0 ratings. 0 user reviews.